This icebreaker game draws people out with questions that are just revealing enough, but not too personal. How well do you really know your friends? Sure, they've trusted you with their deepest hopes and darkest secrets. But do you know whether they'd rather be a giraffe or a dolphin? If they've ever been to the grocery store in their pajamas? Ami Baio's 500-card party game uses intel like that to spark conversation under the guise of competition. 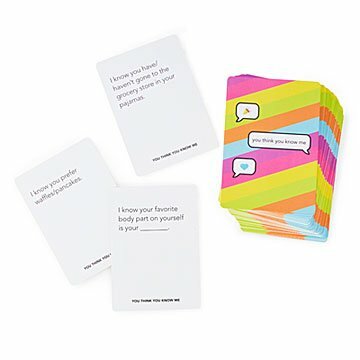 Each card bears a different incomplete short statement, ranging from relatively superficial, "I know your favorite color is _____" to more sensitive, "I know it's easy/hard for you to talk about your feelings". Players take turns choosing a card and a player to read it to, guessing how they'd answer. Technically, victory belongs to one player, but really, as soon as the laughs, surprises, and anecdotes begin, everyone's a winner. Designed in Portland, Oregon. Made in China. Portland, Oregon’s Ami Baio is a closet poetry writer, animal lover, vegan, former massage therapist/personal trainer, and current CrossFit enthusiast. She generally believes in saving the world through good conversation and cake. Ami didn’t intend to be a game designer, but when the idea for You Think You Know Me came to her, she ran with it. It was inspired by the friends she follows on Twitter, Instagram, and Facebook, the people who follow her, and the lives that all of us have projected online. She wanted her game to challenge what we thought we knew about our friends, and in the process, deepen our relationships with them. "My hope is that You Think You Know Me will bring people together to talk and to laugh, to connect and to see each other in new ways, and maybe see themselves in new ways. I know that’s a tall order, but that would be amazing." Well my husband and I haven't played this yet, but my sister, my mom, and I had a great time with it. Some cards develop serious conversations but also a lot of laughs!! Game best used with people who don't really know each other, as family the questions were too easy. We found a way to laugh thru it but wouldn't recommend it for people you know well. Family seemed to enjoy it! I already posted this above. I backed this game on Kickstarter and I'm so happy to see it doing well! It's a really great game to use to get to know your friends even better, and I couldn't reccomend it more! We can't stop playing this game! I love how many ways we've played this game. It's always surprising, whether I just grab a few cards to take to dinner to play while we wait for our food, or when we go deep playing for hours. It always gets us thinking, laughing, and talking. Very clever. Wish I hadn't bought this game. Unfortunately it proved to be boring. We already know each other well and there is no challenge. I enjoy using this with anyone: friends, family, home groups.